The San Jose Blog: Dice.com is Moving to Downtown San Jose! Dice.com is Moving to Downtown San Jose! One of the leaders in tech-related recruiting is finding its way Downtown. 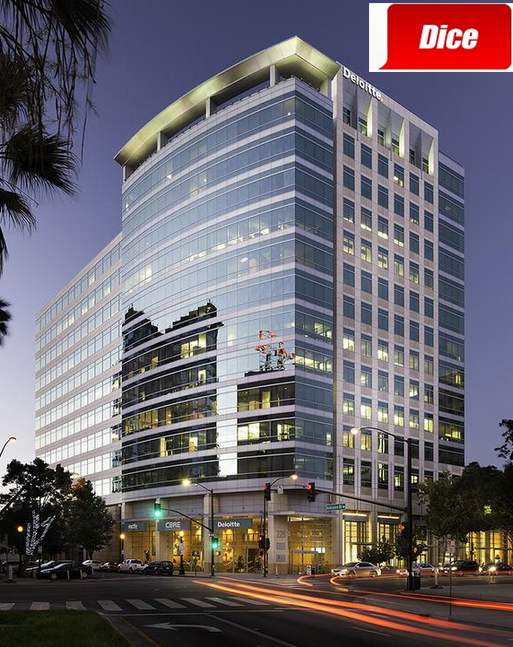 Dice.com has just leased 16,000 SQFT at 225 W. Santa Clara St., which is quadruple the amount of space they currently have in Santa Clara. They will be taking over the 11th floor of the building which also houses Deloitte. The new space will give them the ability to hire about 50 more employees in addition to their current Bay Area headcount. To top off the good news, Slashdot.org will also be bringing its headquarters to the same location. Currently Slashdot (which is owned by the same parent company as Dice) is headquartered in San Francisco. Office locations all up and down 101 were evaluated, and access to Caltrain and amenities such as the San Pedro Square Market were key drivers in the final decision. I'm sure it also helped that they will be able to put Dice signage somewhere on the building. It's great to see tech tenants continuing to come Downtown!